This section of the Town’s website has been made possible through funding from New York State Office of Parks Recreation and Historical Preservation secured by Senator John DeFrancisco’s Heritage Grant Program, administered by the Cultural Resources Council. We must also thank Town Historian Bonnie Kisselstein for assistance with the research, scanning, editing, use of personal photograph’s and post cards and much more. Thanks are also due to the staff at the Baldwinsville Public Library. 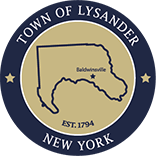 Refer to the history section for more historical information on the Town of Lysander.